Looks nice, but the default title behavier of the browser should be disabled. Mouseover on an input field show the title, then click on the input field show poshy tip. @bartaz: Yep, these are good points. But as Michiel mentions, the image can be optimized and actually it might even be much smaller than 1024x768 in most cases if needed (at least in height usually). Also I believe you'd agree that although CSS3 really allows much it's still not possible to cover all possible designs you could with an image. BTW, the script doesn't limit the use of CSS3 features in any way. You can see that some of the demos use border-radius and no background image (just an arrow). It's very good !! Thank! @bartaz: You do have a point there. However, a big image shouldn't be a big problem if you pick the right file format and make the image simple enough (e.g. no noisy background). Although I too prefer CSS3 over images. But I still like this plugin alot! Really like it! I'm sure I'll be using it somewhere, thanks! I'm not sure if creating and downloading '1024x768 pixels' pixels image is such a good solution. That's a huge thing to load! Most of the browsers nicely support CSS3 rounded corners, shadows, etc. Why not just forget about images? Some things are just perfect. This is one of them. Many thanks for creating this. 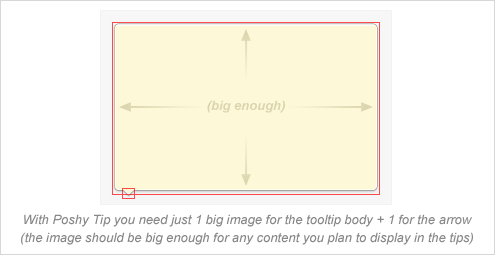 You are absolutely right - there were many tooltip plugins, but you nailed how it should be done.